Lollapalooza Announces 2013 Lineup; Nashville’s Reppin’ Hard! Why any major festival would announce its lineup on April Fool’s Day is beyond me, but based on the all of the leaks in recent weeks, we’re going to count this as official. 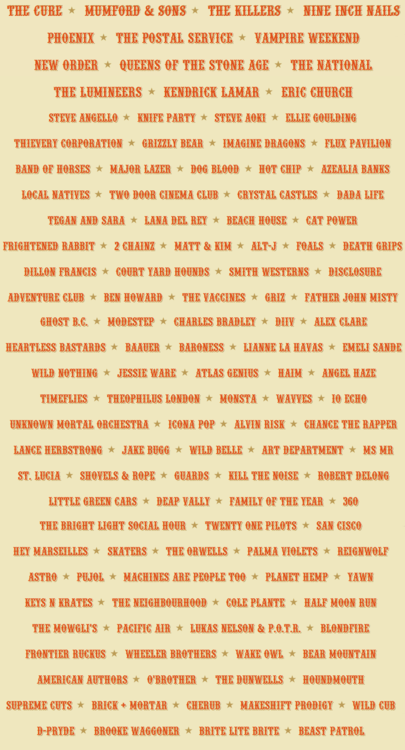 Lollapalooza has announced its 2013 lineup, and it might just be the most exciting festival of the summer! The fest will take place once again in Chicago’s Grant Park, August 2-4. That’s only a 7 hour drive or a cheap MegaBus ticket from Nashville! You can snag tickets here, but they’re now limited to individual day passes. As excited as we are about headliners like The Cure, Nine Inch Nails, The Postal Service, and Vampire Weekend, it’s the Nashville talent that really has us beaming. Local artists on this year’s bill include Brooke Waggoner, Wild Cub, Cherub, Machines Are People Too, and Pujol, along with many of our other favorite out of town up and comers! Very exciting too see that Astro, the wonderful Chilean rockers, are included in this great lineup.